For information about boarding and training packages, and other services offered at Pleasant View, please contact any one of our trainers listed on the "Boarding" page. For pictures of the apartments or the mushrooms operation please visit the right menu on the "gallery page." The farm has been in continuous operation since the 1800's amongst 2 different families, the Bailey's and the Raboy's. The Town of Southeast and surrounding towns of North Salem, Somers and Danbury are rich in Circus heritage. The great American tradition was actually founded in this very area. Hachaliah Bailey was the first American to have an Elephant. Hachaliah and his nephew George F Bailey would be the same family line in the now well known, Barnum and Bailey Circus. Hack's son Oscar would have daughter, Hazel, who married Solomon Heady. It was Solomon who sold the farm to Ervin Raboy in the mid-1960's. 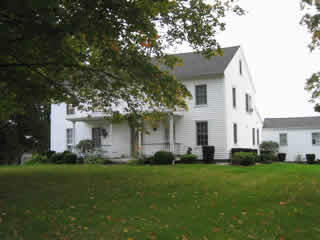 The farm was used primarily for dairy cattle. Gail Borden and his Eagle brand Condensed milk in the center of the village of Brewster bought most of the milk from the 200+ dairy farmers in the area. Most of the rock walls and pasture fields from this era are still intact on our property. When the milk factory closed in the 1920's due to much of the farm land in the area being flooded by the reservior system, the farm still produced milk for several years. Ervin Raboy was not a farmer, but he admired the farm life. He bought what would be Pleasant View Farm in the mid-1960's. He then rented the housing units and turned the dairy into a horse boarding operation. What followed was many years of flux. Horse trainers and barn managers would come and go and the name of the farm would change. Some of the more recent names were: West Wind Stables and Fantasy Farm. Upon passing, Ervin left the farm to his 3 sons and at the later end of the 1990's Edward decided to renovate it into a modern horse facility. In 2003, Edward's son Ervin, took over the management of the farm. Originally it was just an old barn and housing units, but over the next 10 years the farm transformed into its modern form. The barn was redesigned and refinished with an intelligent equine character. Roadways and infarastructure were revamped. The outdoor riding ring was rebuilt and new footing and dust control measures were installed. 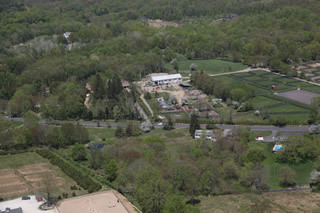 The indoor riding arena was built along with the surrounding parking lots. All the pasture was converted into safe equine sized paddocks. A manure composting facility was installed. And a storage building was made for all the farm equipment.